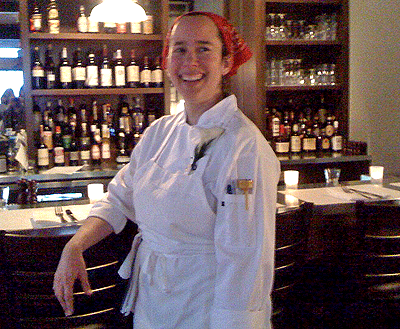 Chef Mary Reilly, owner of Enzo Restaurant & Bar in Newburyport is no exception, and she has taken her interest to a new level. 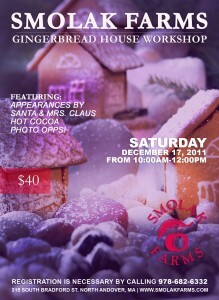 Each year on the anniversary of the flood, she creates dishes with molasses to commemorate the event. When she opened the Enzo almost two years ago, she continued the tradition and offers diners a special menu for the occasion. We caught up with Chef Reilly this weekend and asked her what spurred this connection for her. She told us that she likes unusual anniversaries and this one is especially interesting due to the molasses and because of the Italian immigrants in the North End who were affected. So what will she be serving on Tuesday, the 94th anniversary of the disaster? 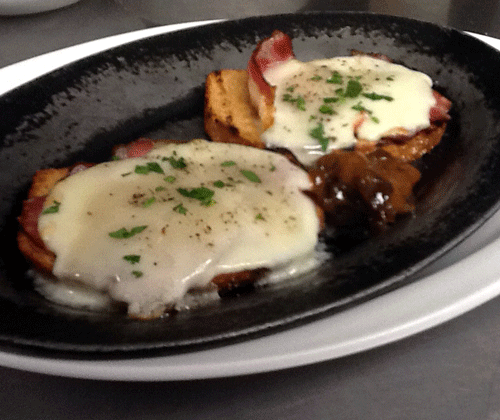 On the savory side, Reilly will be serving a non-traditional bruschetta with house made Anadama bread (the traditional Cape Ann bread made with molasses), house butchered and smoked ham, taleggio, and molasses mustard. 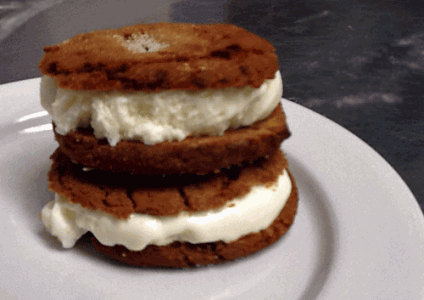 And for a sweet end to their meal, diners can indulge in molasses cookie ice-cream sandwiches. Whether you’re a Molasses Flood enthusiast or just interested in sampling unique menu items, head over to Enzo on Tuesday for a taste of history. 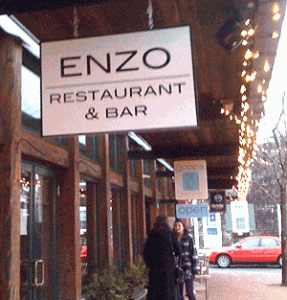 New restaurants are always exciting, and our visit to Enzo Restaurant in Newburyport last week was especially so. We met the owners, Dave and Mary Reilly, shortly after we started North Shore Dish. 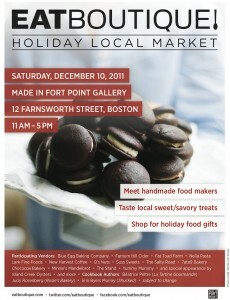 At the time, Mary was a personal chef and taught specialty cooking classes. She and Dave had dreamed of owning a restaurant for years, and last week it came to fruition. We were invited to the restaurant’s soft opening for friends and family. The restaurant opens to the public tonight. Obviously, we’re not presenting our normal review here as we did not dine anonymously. But the food at Enzo is spectacular, and although we’re not unbiased, we stand behind the recommendations here. The idea behind Enzo is an interesting one: Northern Italian cuisine with an emphasis on seasonal, local ingredients and a nod to New England traditions. It’s a twist we hadn’t experienced before, and it makes for some great combinations. We started with an order of house-made potato chips with caramelized onion dip ($5). The chips are large and crisp, perfect for dipping in the savory onion and white bean mixture. We had dip left over, and our waitress offered to bring some bread so we could continue happily dipping. We also sampled the fritto misto, in this case made with Rhode Island squid and tiny Maine shrimp, served with garlic mayo and fried lemon slices ($10). 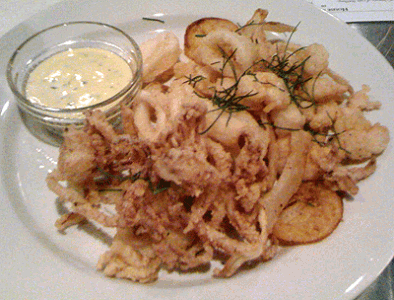 It was exceptionally light for a fried dish, and the squid was more tender than usual. To round out our fried-food extravaganza, we nibbled on breaded olives stuffed with herbed cheese ($5) and declared them the perfect bar snack. We also tried two of the house cocktails, both made with spirits from Gloucester’s Ryan and Wood Distillery. The Caldwell Smash combines Folly Cove rum, allspice, dram, apricot brandy, lemon, honey syrup, and mint in a refreshing balance of sweet and tart ($10). 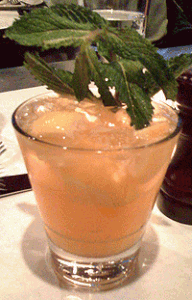 The Cane Nebbioso features Beauport vodka, fresh-squeezed grapefruit juice, and Ramazzotti liqueur ($9). The emphasis that Mary puts on using top-quality ingredients and making as much as possible in-house came through even more clearly in our entrées. The bread for the pork sausage sandwich was a house-made stecca roll, and the sausage is from New Hampshire’s Kellie Brook Farm. It was accompanied by garlicky greens and house-made chips ($14). Fresh bread showed up again in the chicken under a brick ($21), this time in the form of big cubes of foccacia in an unconventional stuffing. The chicken was moist inside with very crispy skin, and the half-bird serving allowed us to enjoy it for lunch the next day. We tried two traditional Italian dishes, and both were outstanding. The risotto was cooked in red wine for an unbelievable flavor, and the poached egg on top added a further touch of richness ($16). The filled pasta called pansotti was so good we kept eating long after we should have stopped—the cheese filling was flavorful, the walnut pesto was creamy, and the pasta was almost paper thin ($18). The New England side of the restaurant’s equation gets a bit more play after dinner. All desserts are made in-house, and they are worth the indulgence. 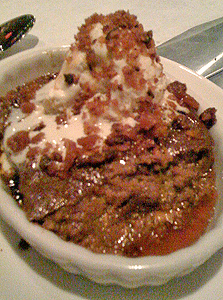 Mary has taken the childhood favorite of many, Indian pudding, to a new level with zabaglione ice cream, bacon brittle, and bourbon syrup ($7). Chocolate addicts can get their fix with the chocolate tart featuring thick caramel and dark chocolate ganache. But the surprise favorite was the lemon posset, an impossibly silky, very tart pudding served with softly whipped cream ($6) that we hope never goes off the menu.